John's Beer Blog: 7/17/16: Ads! Good evening, everyone. If you're reading this there's probably a good chance that you've noticed something new along the righthand side of the screen. It may have piqued your interest enough that you've actually clicked it. That's right--it's an ad! I'm talking about it upfront because I know that ads annoy a ton of people (myself included). Homebrew Supply reached out to me a few weeks ago to tell me they thought I would be a good candidate for their affiliate program. I thought so too, so I've been working with them to get my affiliate account set up and ads on the blog. 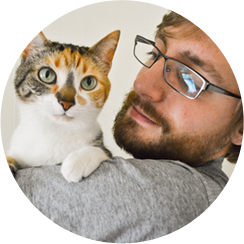 As of today, we've gone live! Here's how it works--if you click the ad and buy something, John Likes Beer will get some of the profits. I've already decided that whatever I make will be spent on beer to review for the blog. 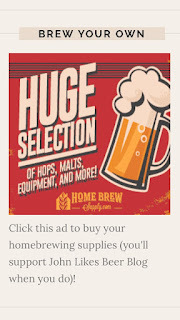 So, that means that by purchasing something from the page that opens by clicking the ad (or the "Homebrew Supply" linked already in this post) you'll be directly supporting the content on this blog! Here's the most important thing: If you don't like the ad, don't let it get to you. I've put it off to the side. It doesn't make any noise. It shouldn't disturb your enjoyment of my posts. Please do not feel any need to purchase anything through the ad. I saw it as something fun and new; something that could (potentially) add to the content of John Likes Beer. But, if you don't want to buy anything, don't. Just do you. And that's it! 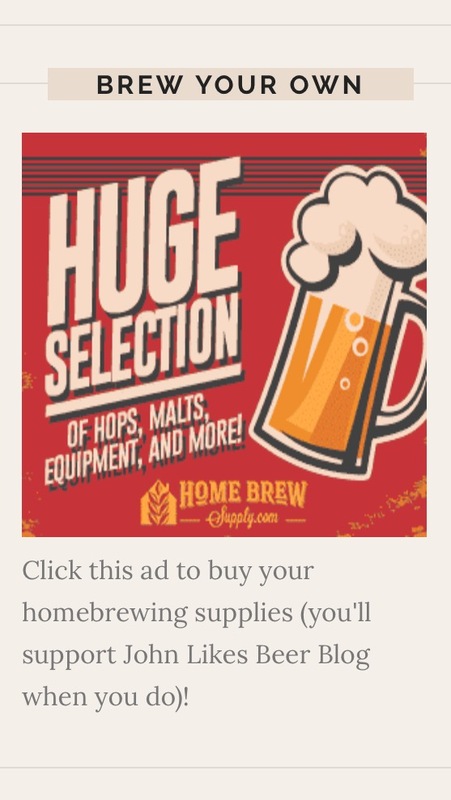 Thanks for reading and, if you feel so inclined, check out what Homebrew Supply has to offer. They have great stuff that's relevant to my interests and (if you're reading my blog), I assume, yours.